What a rollercoaster ride last week was. 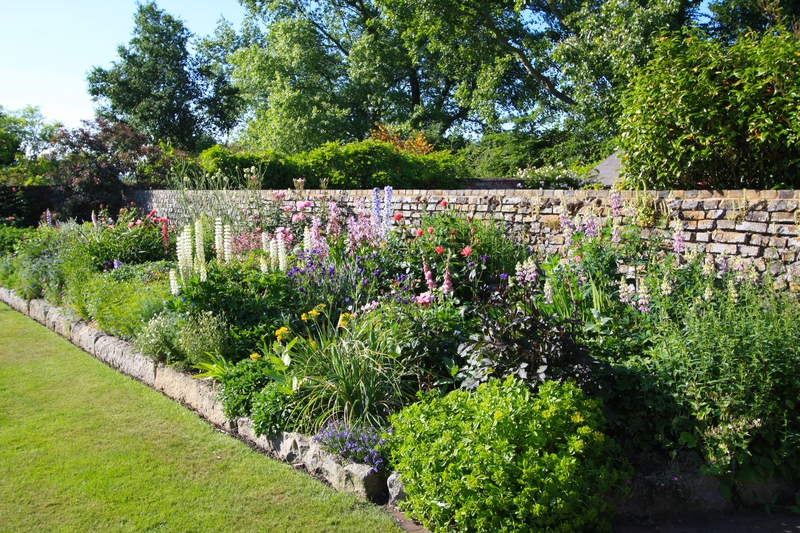 It began with visits to two very fine private gardens, open by appointment for the National Garden Scheme, and ended with a frantic day of potting up and bedding out in my own garden at The Watch House. In between came the RHS Chatsworth Flower Show in Derbyshire and a whirlwind tour of Coton Manor Gardens in Northamptonshire. The days had all become a blur by Sunday. Writing this post, it’s been a pleasure reflecting on what was a happy, varied and sunny week: the sort I’d like to enjoy many more of. England is magical in May and early June, which is why I like to take most of my holidays then. I return to work today looking forward to a well-earned rest. How lucky we are to live in a country so blessed with beautiful countryside and great gardens. I sometimes have to remind myself of that. All the locations I visited last week will be getting their own posts in due course (perhaps not Newport Pagnell Motorway Services), but in the meantime, here’s a taste of my adventures. First stop was The Orchard, home to Mark Lane who you may recognise from the BBC’s Gardeners’ World. When not on our screens, Mark is a busy and successful garden designer and writer. He made his name in publishing before an accident and subsequent diagnosis with spina bifida meant that he required a wheelchair to get about. Mark re-trained and has never looked back. As one might expect, The Orchard is skilfully adapted for wheelchair access, but the design is not compromised by this. 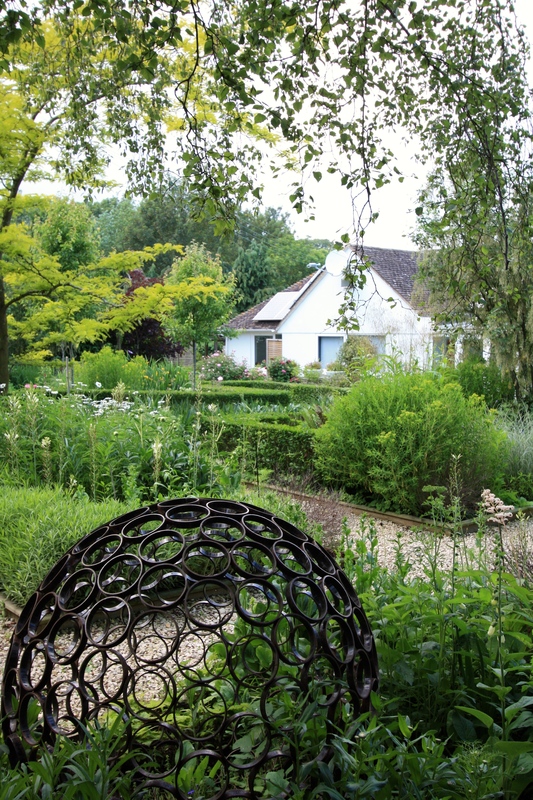 Mark’s aesthetic is contemporary, softened by varied, multi-layered planting. There’s a strong emphasis on structure, interesting perennials and plants which attract wildlife into the garden. The Orchard is open by appointment to small groups of four or less, between July 1st and August 31st 2018. Individuals are also very welcome. Mark and his partner Jasen are charming, enthusiastic hosts, making my visit a thoroughly enjoyable one. Click here for details about how to arrange a visit to The Orchard. On the same day I visited Marshborough Farmhouse near Sandwich (pictured above). Rarely does one come across a private garden of this calibre in terms of plantsmanship and standards of gardening. Quite simply it blew my socks off. I left wanting to return again and again, bowled over by the owners’ knowledge and commitment to their garden, which is all consuming. 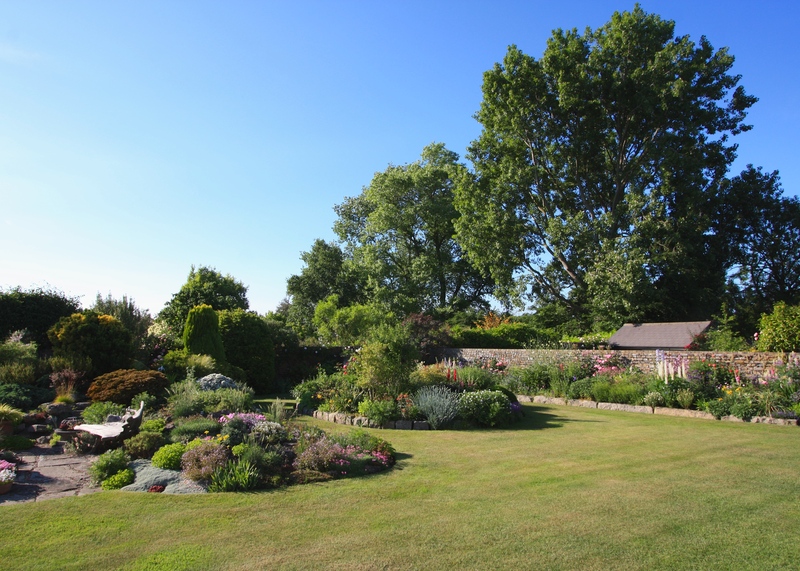 From 2.5 acres of Kentish farmland Sarah and David Ash have gently fashioned a garden of great character. Their collection of plants, many of which have been raised from seed or cuttings, is stupendous and will delight anyone with a passion for plants. Unlike my garden, which is on chalk, the soil here is slightly acidic, sandy loam and very sharply drained. This makes it possible to grow all sorts of Australian and New Zealand natives, as well as Mediterranean plants. I don’t mind admitting that I was completely in awe of this garden and returned home feeling that I must try harder. Visits for groups of ten or more can be arranged between the 18th and 29th of June 2018, and again between the 20th and 31st of August. I would heartily recommend taking a notebook and pencil as I guarantee you will encounter plants you’ve never seen before. Click here for details about how to visit Marshborough Farmhouse. 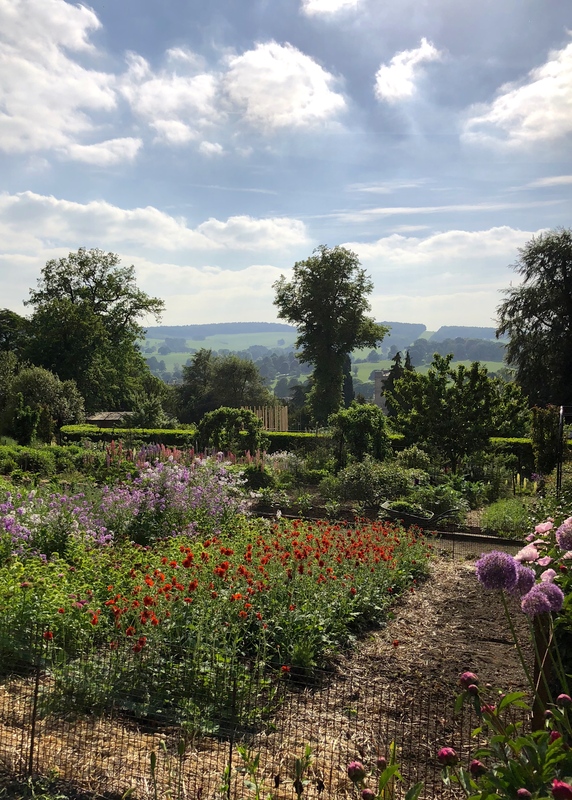 Whilst at Chatsworth I managed to sneak up to the walled gardens, located on a gentle slope high above the big house and with a magical view of Capability Brown’s expansive landscape park. 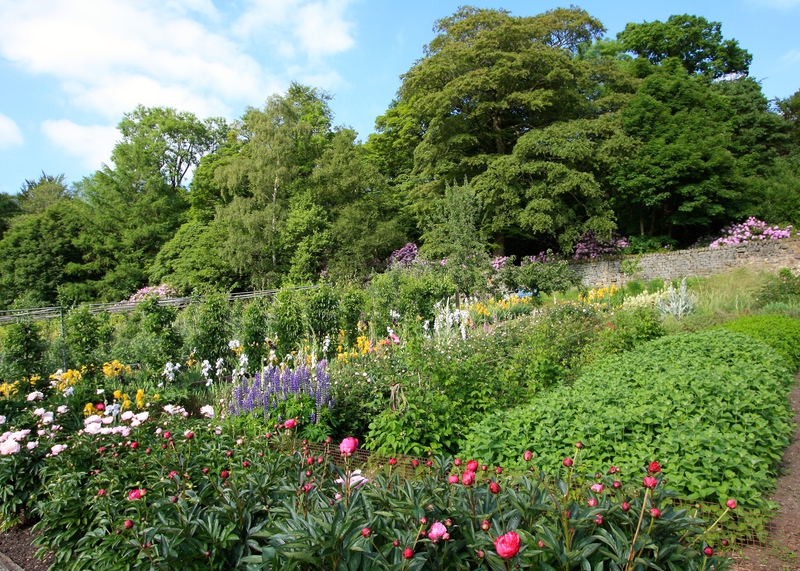 The hanging woods behind march right up to the mellow stone walls, lilac rhododendrons spilling bountifully over. This is the sort of place I imagine gardeners might go if they qualified for heaven. Gardener and guardian angel Becky Crowley presides cheerfully over a cutting garden packed with peonies, hesperis, irises, geums and roses, alongside generous plots of fruit and vegetables. Much longer required here on my next visit. When I’m travelling cross-country I try not to waste an opportunity to stop off at a garden en route, especially when I have a car that I can pack with plants. 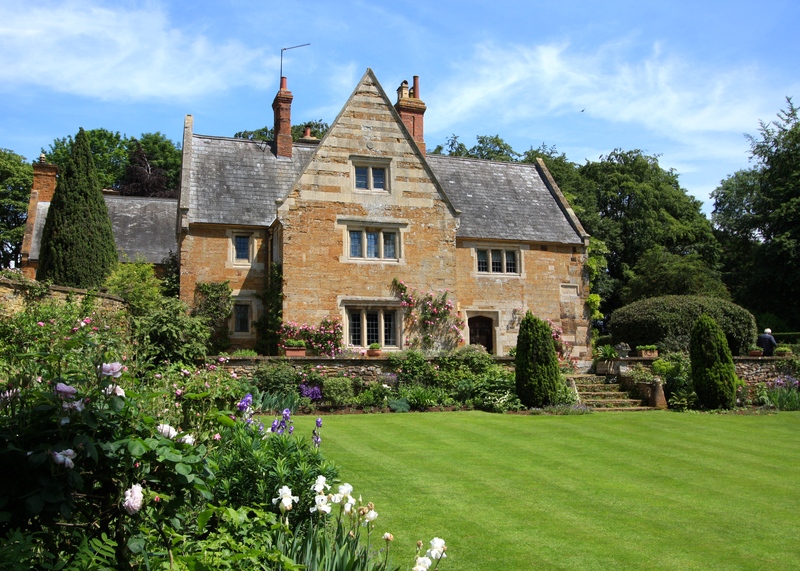 The night before my journey I Googled “Gardens near the M1” and up popped Coton Manor Gardens. I’ve been researching and visiting gardens for over 25 years, yet somehow I’d never heard of this one: remiss of me, yet what a fabulous find. 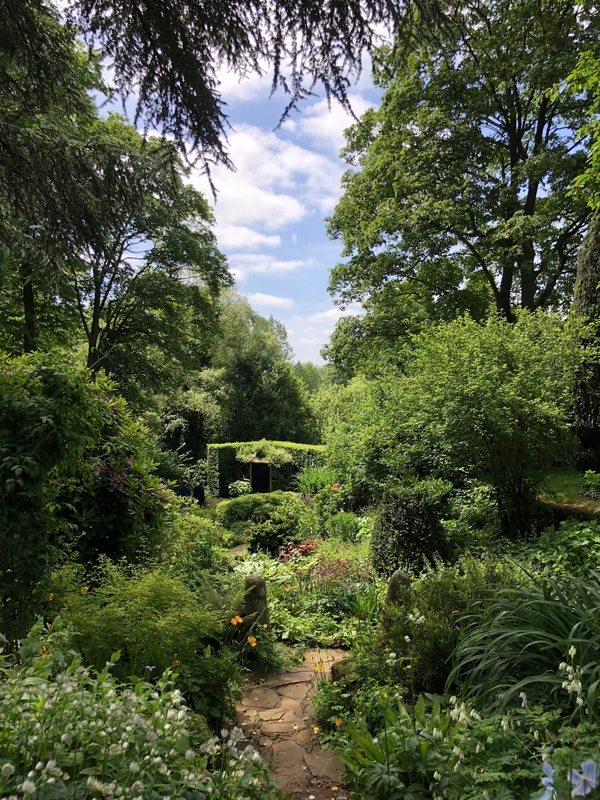 The garden at Coton Manor possesses the kind of quality, charm and personality that is lacking in some better-known gardens. It has developed slowly and organically around a handsome house, resulting in a layout which is both unexpected and exciting. The use of water in the garden is especially ingenious, with pretty streams, pools and rills that could easily inspire smaller gardens. A flock of placid, coral-pink flamingos is a point of fascination for young and old. The plant nursery is full of good quality, home-grown plants and naturally I succumbed to its charms as well. Mine were a rose called ‘Pearl Drift’, Iris chrysographes (black form), Viola ‘Irish Molly’, Clematis recta ‘Purpurea’, Dahlia ‘Ragged Robin’ and Agapanthus ‘Silver Moon’. Of course, I needed them all, no question. My greatest regret is that I didn’t have time to stop for lunch, which looked good. If it comes to a choice between buying plants and feeding myself, buying plants will always come first. This is a possible but very expensive diet plan. I was compelled to go back to work for two days before the weekend began. I love my job, but at times like these I’d rather be outside getting my hands dirty. Saturday was a bit of a write-off as I had made plans to spend time with friends. 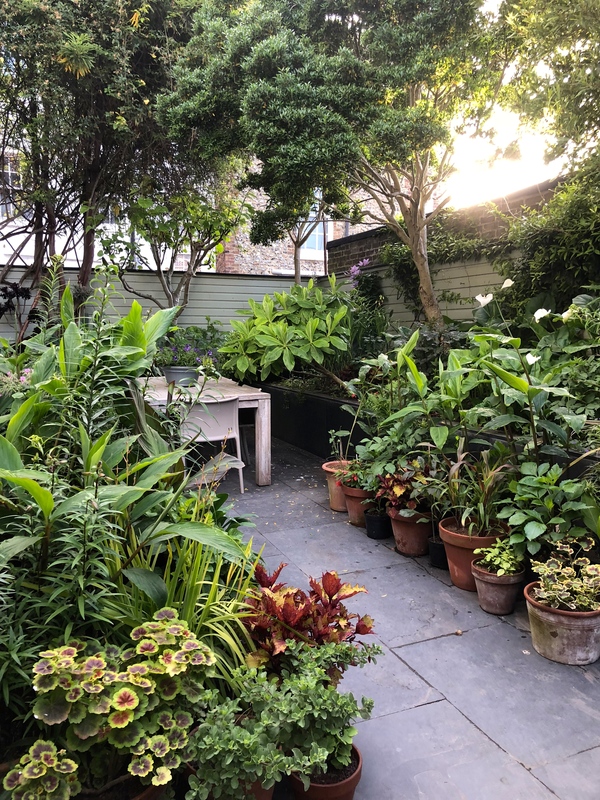 On Sunday I set about the Jungle Garden with a remarkable amount of vigour given I couldn’t actually remember getting home the night before (I do know I was in bed by midnight and I appear to have eaten toast and marmalade before doing so). I was feeling a little overwhelmed by the task in hand, but quickly found that there’s nothing like getting stuck in to make a job seem less daunting. 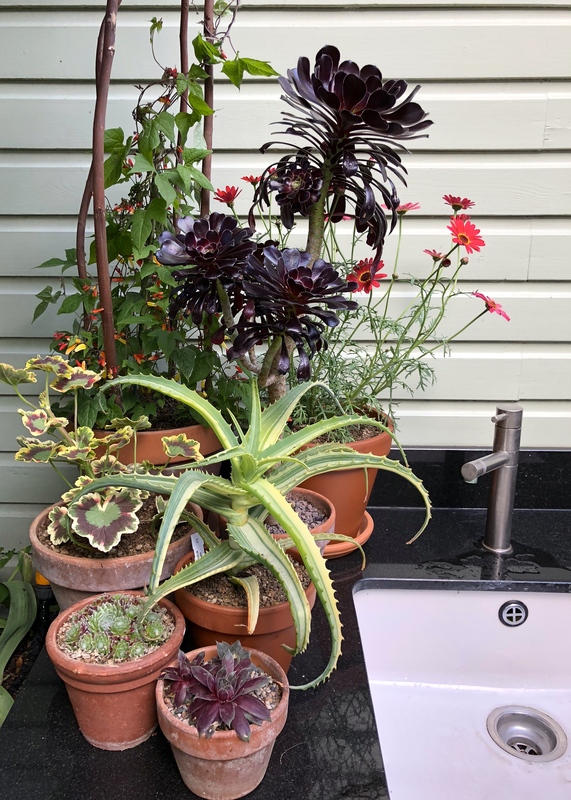 In the space of eight hours I managed to plant out my aeoniums (a task which requires some delicacy now that some are over 5ft tall), half a dozen colocasias and trays of a superb coleus named ‘Henna’. I also put some effort into grouping my potted plants so that they can start to mingle and knit together. I reckon on them needing a good two months to look established before my garden opening in early August. Ideally visitors won’t be able to detect any pots at all by then and the plants will have formed parallel banks of flower and foliage. TFG.